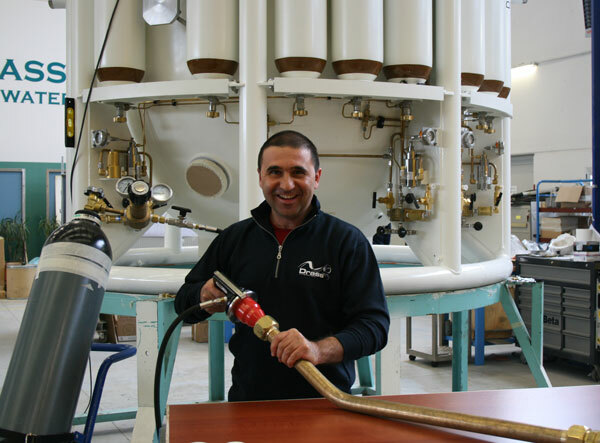 Hello, I’m Fabrizio the responsable for monitoring the quality and the cleaning procedure for the Tungum piping. I’m the team leader of the Gas Control Panels Manufacturing. I’m one of Drass oldest employee and here is one experience that I remember very well. Bologna: a hyperbaric chamber mounted on drilling apparatus that was making a tunnel for high speed trains: we worked in temperatures of 40°C, the machine was continuously drilling and positioning enormous cement blocks around the hyperbaric chamber and we were doing our intervention with just a little fear – we were 2 km inside the tunnel, the air we breathed was particularly heavy, it was crazily hot! However, amazing adventure!